DOHA, Qatar (AP) — Nasser Al-Khater glances out his window across Doha Bay. The view is far different than it was eight years ago, when al-Khater served as part of the team that helped Qatar pull off a staggering upset to land the 2022 FIFA World Cup. The construction boom that accompanied the winning bid has been built on the backs of migrant laborers from India, Pakistan, Nepal and other Asian nations, much like it has in other oil-rich sheikhdoms in the region. As oil prices crashed below $30 a barrel in 2016, construction firms in Qatar and elsewhere in the region suffered. Some stopped paying staffers on time, if at all. Others seized workers’ passports or otherwise abused Qatar’s “kafala” system that ties expatriate workers to a single employer. 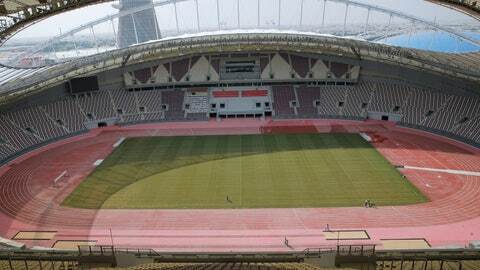 In an era of bloat where budgets for big ticket events like the World Cup and the Olympics are calculated and then blown up, Qatar is determined to prove it can dazzle without saddling itself with hulking stadiums left unoccupied once the party ends. The majority of the venues used in the World Cup will have their capacity diminished from 40,000 to 20,000 after tournament, with the sections taken out then put up for sale. What’s left will serve as the home pitches for the local professional teams. Yasser Al-Mulla oversees a turf farm a few miles west of the city center, where he’s tested 36 different kinds of grass, exposing them to various amounts of shade, sunlight and other forms of treatment to see what works. The turf isn’t designed simply for the games but for the open recreational areas that will surround the venues after the World Cup is gone. The strain of grass it believes it will use for the World Cup could possibly signal an opportunity for other arid countries to introduce their own public green spaces. Regardless Qatar continues to forge ahead, intent on making sure that its promise to “Deliver Amazing” is not broken. What once felt like a far-off goal is becoming more tangible — and Qataris believe — more attainable by the day.